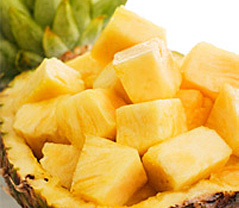 The Pineapple Chunks are produced from fresh pineapples of the gold variety. They are ripened, sorted, washed, cored, and peeled. They are then cut into chunks manually and fed to IQF. The Individually Quick Frozen chunks are then sieved, inspected, weighed and packed. The packed cartons are fed through a metal detector and transferred to the cold store at -18° C. The entire process is carried out under strictly hygienic conditions.